Jill L. Caviglia-Harris, Salisbury University, "Applying Design Concepts to Increase the Impact of your Presentations"
Christopher F. Dumas, University of North Carolina - Wilmington, "Adding Logic and Proof Concepts to Your Intro Courses"
Sarah Andrea Jacobson, Williams College, "Social Media but in a Way That's Kind of Useful"
Will Wheeler, U.S. Environmental Protection Agency, "Writing Grants is a Skill: Tips for Success"
John C. Whitehead, Appalachian State University, "Consulting on the Side"
Here is the link to all of the sessions: https://www.southerneconomic.org/current-year-program/?conferenceId=4&organizationId=2. This community voted overwhelmingly for Donald Trump. But now his immigration changes are killing its livelihood — legendary crabs that are a mainstay of the local economy and a regional delicacy. For decades, Hoopers Island, known for its crabbing industry, has relied on a federal seasonal work program — known as H-2B visas — to keep its businesses humming. This has allowed employers to hire foreigners, mostly Mexican women, to come temporarily to pick crab meat. But this year, the cap on H-2B visas — and a shift from the first-come, first-served based model to a lottery system that has disadvantaged Hoopers Island seasonal workers — has left the island without 40 percent of the visas they have needed in the past. The economics here are pretty straight forward. The number of workers supplied at any particular wage is equal to the number of domestic workers willing to work at that wage, plus the number of H2B (foreign) workers willing to work at that wage. For example, if the crab-picking wage is $10 per hour, and the number of domestic workers willing to pick crabs at $10 per hour is 100, and the number of H2B workers willing to pick crabs for $10 per hour is 200, then the total number of workers supplied at a wage of $10 per hour is $300. If the number of H2B visas are cut by 40%, then the number of H2B crab pickers willing to work at $10 per hour becomes 120, and the total number of workers supplied at $10 per hour is now 220. In other words, restricting the number of foreign workers results in a decrease in the supply of labor to the crab-picking industry. So what are the effects of a decrease in the supply of labor in teh crab-picking industry? Wages for crab-picking will increase. A decrease in supply of crab-pickers will cause the equilibrium price of crab-pickers to increase. Those crab-pickers who are hired will get higher wages. The number of domestic crab-pickers will increase. At higher wages, the number of domestic crab-pickers willing to work will increase. Since the supply of foreign crab-pickers has been reduced, a part of the shortage of workers will be filled by drawing new domestic crab-pickers into the crab-picking jobs. The total number of crab-pickers will decrease. As with any decrease in supply, the equilibrium quantity of workers in the crab-picking market will decrease as the supply of workers decreases. The gain in domestic workers is more than offset by the loss of H2B workers. So in the market for crab-picker we will have higher wages for more domestic workers, with fewer H2B workers in the market, and lower total employment among all crab-pickers. SO if you are a protectionist, this doesn't sound all bad. We have more domestic workers employed at higher wages. Right? Well, sort of. We also have to think about what else happens. A decrease in supply of H2B workers in the crab-picking industry will decrease the supply of domestic workers in other industries--driving up those wages as well. But workers getting paid more is a good thing, right? A decrease in the supply of any output for which wages have gone up will see higher prices and lower quantities produced/consumed. The decrease in the supply of labor will cause higher crab (and other food goods) prices. *I know that's a cheap joke, but I bet John laughed. The Department of Economics and the Center for Economic Research & Policy Analysis at Appalachian State University will hold the 2018 Appalachian Experimental and Environmental Economics Workshop on April 27-28, 2018 at the BRAHM in Blowing Rock NC. This workshop is part of a regular series of workshops hosted by Appalachian State that brings together junior and senior scholars that use experimental methods (lab, field and survey) to study issues related to environmental and natural resource policy. Here is the program: https://2018-exp-env-workshop.weebly.com/program.html. BTW, who scheduled this during MerleFest? You will be asked to enter relevant author information and upload a pdf document with your paper's title, author names and an abstract of no more than 1,000 words. Authors may submit more than one abstract. Abstracts are due March 15. Authors will be notified of paper acceptance by March 30. A draft AERE program will be available on April 15 when sessions are due to the SEA. The presentation of research in AERE-sponsored sessions is a benefit AERE provides expressly for its members. Although membership is not required to submit an abstract for consideration, if your paper is accepted, you will be required to join AERE, or renew your membership, in order to be placed on the draft program on April 15. Presenters are required by the SEA to register for the SEA meetings. Abstract submissions for the AERE sponsored sessions at the MEA meetings are due in just two weeks, onSeptember 1, 2017. This year, we have a fancy new submission portal through the AERE website, so you don’t have to bother with remembering my personal email any longer. Meeting Details: The 2018 MEA meetings will be held in Evanston, Illinois, from March 23-March 25 and, as in years past, submission through an AERE organized session is free. Additionally, if you participate in an AERE sponsored session you will be included in all planned AERE networking activities that will take place during the MEA meetings – last year this included not just a dinner, but a cocktail hour as well with drinks sponsored by AERE. Please consider submitting an abstract – we had such an amazing program last year, let’s do it again! Should you have any questions, please feel free to contact me personally at [email protected]. Also, please pass along this email to any colleague you think would be interested. 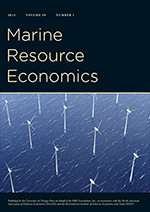 Graduate students in Ph.D. programs who have research interests in environmental and natural resource economics are invited to submit an abstract for designated student AERE sponsored conference sessions at the SEA meetings. Interested students should email Elaine Frey ([email protected]) a document that contains their name, program of study, university, faculty advisor, a paper title, and a brief description of their research (no more than 100 words) by March 3. Presenters are not expected to provide a research paper and will not be asked to serve as a discussant. Benefits of presenting include getting valuable feedback on your work and opportunities to network with economists in the field. In addition, AERE will organize a mentoring panel, which will provide student participants information on topics relevant to their success in the field. The 87th Annual Meeting of the SEA will be held in Tampa, Florida at the Marriott Waterside Hotel & Marina, November 17-19, 2017 (Friday through Sunday). John Whitehead (Appalachian State University) is once again organizing the AERE sessions. Abstracts will be accepted for consideration beginning January 30, 2017 through the [email protected] website (click here) and must be submitted by March 10, 2017, midnight PDT. Proposals for complete sessions are also encouraged. Organizers of proposed sessions should submit abstracts for EACH of the papers. Papers may be accepted or rejected on an individual basis unless the organizer specifically requests the session be considered only in its entirety. Please note that all selected presenters must be 2017 AERE members. Membership of presenters will be verified one month after notification of acceptance. Papers of non-members will be dropped from the program. (We regret we do not have sufficient staff to send membership reminders to non-members.) Also, priority consideration for discussants will be given to current AERE members. I'm very excited. This is the first year that presenters can submit abstracts via an online submission system instead of sending me an email (and then I lose your email). The online submission website is here: http://www.mymeetingsavvy.com/aere-sea/login.aspx. Note also that there is box that you can check to volunteer to serve as an abstract reviewer. Please feel compelled to do so! This will be very helpful and looks great on your vita ("[email protected] Organizing Committee 2017"). The 2017 conference website is here: https://www.southerneconomic.org/conference/. Note that you will be required to register for the SEA conference (and pay a fat registration fee to the SEA in addition to the required AERE membership ... but you should already be a member of AERE anyway).